This post aims to fix error “Windows cannot be installed to this disk. The selected disk has an MBR partition table. On EFI system, Windows can only be installed to GPT disks.” It provides step-by-step solutions to help you get rid of the issue so that you can install Windows without problem. MBR VS GPT, which one is better for your computer? MBR stands for Master Boot Record which is a special boot sector located at the very beginning of storage device. It contains boot loader for operating system. The shortcoming lies in that MBR disk can manage up to 2TB disk space and it can hold four primary partitions at most. GPT is the short form of GUID (Global Unique Identifier) Partition Table and it is another way to storing partition information. GPT disk eliminates limitations on MBR, thus it doesn’t have limit on disk capacity or partition numbers. When you set up new disk on Windows 8 or 10, you will be recommended to use GPT. It mainly depends on your BIOS configuration whether you can use MBR or GPT. Old computers usually employ Legacy BIOS + MBR boot mode, while recent computers use UEFI + GPT. If you do not follow these rules, you are likely to encounter error messages talked about in this post. 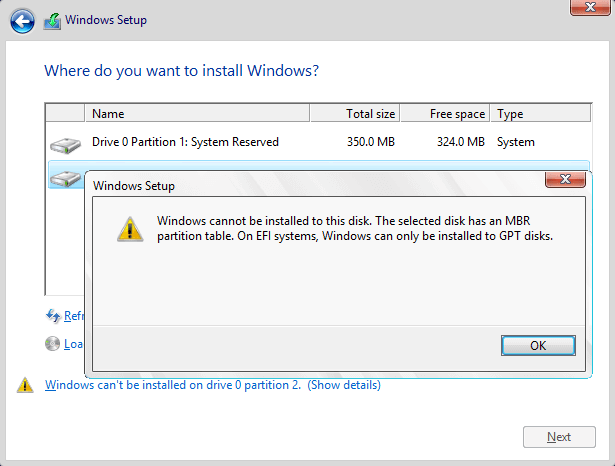 How to fix “the selected disk has an MBR partition table”? You can go through BIOS setting and change the UEFI boot configuration. What you need to do is temporarily switching EFI boot to SATA or legacy mode so that Windows can be installed to Legacy + MBR booted computer. Restart computer and enter BIOS by pressing Del or F10 before system boots. The specific key varies from Motherboard brand to another, but you can see it on screen soon after computer is powered on. In BIOS, go to Boot Devices and find Boot order where you can disable EFI sources or change DVD drive from UEFI to SATA or Legacy Mode. Boot computer with system installing CD or disk and try install again. For the moment, your hard drive is of MBR style while BIOS is set to UEFI boot mode. Thus another way to solve this error is converting MBR partition table to GPT. When the disk is converted to GPT, you will no longer face the issue. Install and launch PartitionGuru Free. You can download this free partition manger free of charge from Eassos download center. Locate and select the MBR disk to be converted to GPT in PartitionGuru Free and click Disk menu to choose “Convert To GUID Partition Table”. Click OK button on the message box. Then click Save All button to make the converting work. When the disk is converted to GPT, you can retry installing Windows again. Click “Save All” button to save changes to partition table and the conversion takes effect. This entry was posted in Partition Manager and tagged the selected disk has an MBR partition table, Windows cannot be installed to this disk by EASSOS. Bookmark the permalink.